I originally was going to include this with the RazorHD review, but decided to seperate the two. 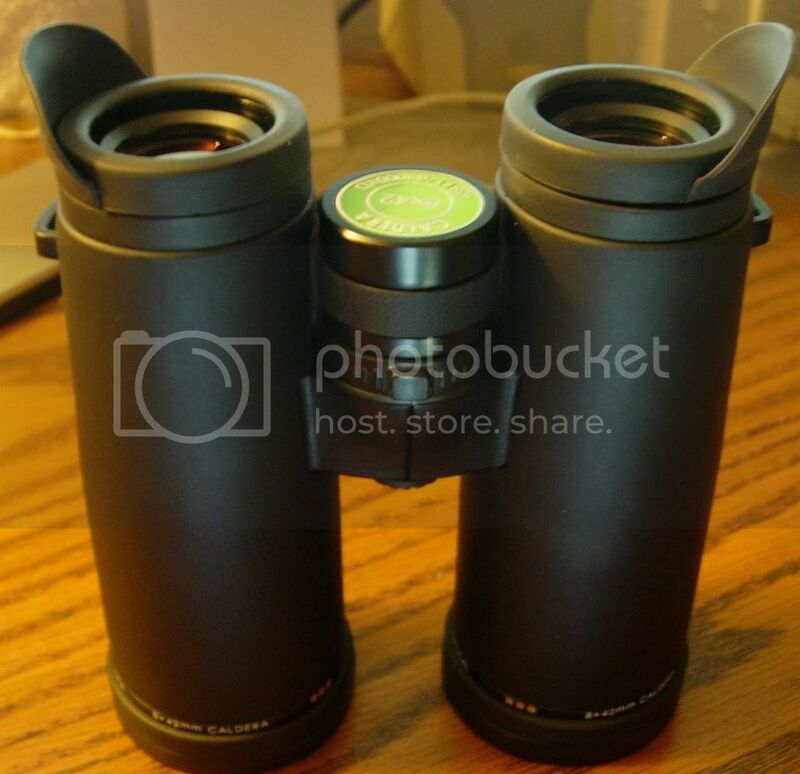 This is a mid price binocular, selling for $379 for the 8x version I have. I am pretty impressed by the abilities of the current $4-500 binoculars to deliver the goods far above and beyond their asking price. This is a more reasonable comparison to the ZEN ED 2 and the Theron Wapiti APO-ED and a couple of others. There are some differences here that will help separate the three. Curiosity is always there for use as a reason too. Kruger takes a little different approach to making things in China The Kruger Corporate Headquarters and factory (one of them) is in Sisters, OR, a bit over a two hour drive north of me. I have been there twice. This is where they do all their optical design. They design, engineer, build the prototypes (they have complete CNC controlled manufacturing ability), and do product development here. They are currently building a couple of riflescopes in Sisters. Some of the parts come from their China facilities. They intend to expand as much of the assembly work at the Sisters site as they can. Kruger started out with a couple of Leupold engineers who started Pacific Rim Optical. This is a division of the now larger parent Kruger Optical and wholly owned by Kruger. PRO makes optical glass for almost any sort of optical use you can think of. When the Kruger design and engineer team starts building an optical instrument, PRO makes the prototype lenses and prisms. When they go to production, Kruger owns the assembly facility in China which uses PRO glass. Kruger has ownership of the whole process. While some of the process is in China, Kruger still owns it all. They use the terms “Crafted in the USA” or “Engineered in the USA”. That will not be good enough for some, but that is what it is too. Kruger also builds things for other companies. One binocular they build is the Cabela’s Alpha Extreme. They also build one of the Cabela’s Pine Ridge binoculars as well. The Caldera got a pretty decent workout alongside the Razor HD, the ZEN ED 2, and the Promaster ELX ED. There are a couple of things that immediately stand out with the Caldera. First it is a very short binocular, no longer than a 32 mm compact. I would not say it is particularly compact, but it is enough smaller in size that the difference is obvious from the other binoculars. The second thing is the unique ergonomics. It looks like somebody forgot to install the front hinge of a double hinge design. The engineers flatly told me that the hinge is strong enough, as strong as any and any blow that will damage this hinge will damage any binocular. The reason for the no front hinge is to give the pinky fingers a place to go and to give enough room to have the tethered eye cups stay in place. So this gives a different feel than you get from other binoculars. This has built in fold up/down winged eye shields and the rain guard is designed oversized to fit over the folded down wings. Personally, I happen to like the feature, but eye glass wearers may not find it useful. The eye cup wings offer a source of nit pick. They rotate too easily and are never in the same place as they were when you take off the ocular covers. This has a nice, substantial feel, and the construction seems better than some other mid price stuff. The Caldera comes with fluorite objectives, full broadband coating, and dielectric mirroring. It also has hard, scratch resistant, and substance repellent coatings. It is a very dark charcoal gray/black armored unit with three longitudinal grooves along the side of the binocular. There is a polygonal indentation for the thumbs that is different from anything I have seen. The case is a zippered clamshell style, similar to what is seen with some Vortex or Zen Ray stuff. They include a patented “cool neck” strap, which is really a pretty good strap. It is light and wide and has an eight inch by two inch zippered compartment. The compartment will hold whatever you wish, but the idea is to use it to hold refreezable cold packs or hot packs. Two hand warmer packs come in the package. They include two QD straps to go on the binocular and the strap snaps into the QD clips. You get two sets of QD release straps. There is no lettering on the strap, so you won't look like a walking Kruger billboard . This may be just me, but the 438’ FOV seems wider than the specs indicate it is. This was somewhat of a surprise as the ZEN ED has a 426’ FOV. That’s 8.34* for the Caldera and 8.11* for the ZEN ED. I didn’t think that would be a noticeable difference, but to me anyway, it is. It has about the same presence in width as far as "viewing impression" of the ZEN ED 7x36 or even seems very close to my old Swift Nighthawk 8x40 porro which is 9.5* (499'). I’m not sure why this is, or if it will seem so to anyone else, but I sure notice it. On another post here someplace somebody indicated a rolling ball effect with this glass. I saw absolutely no indication of it. There seems to be enough edge pincushion to prevent the effect. The Caldera focuses counterclockwise to infinity. There is two full turns of focus wheel travel. The close focus is 6 feet. From there to 20 feet takes the same 0.75 turn needed by the Razor HD. From 20 feet to infinity uses another 0.50 turns, leaving 0.75 turns of focus past infinity. The wheel is smooth, with about the right tension and there is no backlash. There is a right eye diopter adjustment on the back of the focus wheel. This one has a small button that is pushed down to unlock the diopter and with the button down, the diopter is adjusted. When done, the mechanism locks when released. As noted above, the image seems quite wide, giving a big, pleasant view. The image is quite bright, sharp, and has very good contrast. There is a little pincushion at the edge and also some field curvature. The sweet spot is about 70% of the fov. No, the edges are probably not sharp enough for the users who worry about that, but they are as sharp as most binoculars and sharper than many. I could find no CA or fringing of any kind. This glass handles stray light very well and I found no veiling glare, even panning under the sun or with the setting sun behind me. I got a situation on a recent morning where with a bright, clear sky panning under 7:00 am sunshine over a scenery coated with morning frost where I got some glare right under the sun with the RazorHD. The Caldera handled that glare better than the new Razor. The Caldera is better than the ZEN ED 2 in both areas, and about like the Theron APO-ED. There is not a lot to separate the image of this and the ZEN ED 2, or the Vortex Talon, and the rest of he class of excellent mid price selections. The Caldera, as well as the ZEN, Promaster, and Theron continue to impress with their optical ability. The Caldera has the edge in a big fov, more compact size, an apparently superior construction, and is the most comfortable for me to hold. The Theron is sharper at the edge, a little brighter, but a smaller fov. The Promaster has a little warmer color bias, but all are pretty good. I had some comparison to the Bushnell Legend Ultra HD as well. The Bushnell is lighter than the rest, has as good centerfield sharpness, but all of the samples I have seen have smaller sweet spot than the others, as well as softer edges. The Bushnell construction strikes me as a little “light”. These are a step down from the new Razor HD, but the differences are still slim. I guess. I'll quit editing the review and post this seperately. I did have an issue with the unit I got from SWFA, and it was the reason for my second trip to the Kruger facility. The first was to get a look at the Caldera. At any rate, the unit I had had different resolution ability in each barrel. One pretty good and the other barely within spec. The collimation was still within spec, but since the weak resolution barrel was also the one not quite collimated, the unit acted as if it had no depth of field, and focus between barels was tenuous at best. Sharp and precise image at the shallow depth to which it could be focused, but annoying. It was an experience to talk with the engineer and watch him check resolution and collimation. We checked out a replacement unit and it was good to go. So I got the swap done in a day instead of waithin several shipping days each way. I also got to hear for myself what the engineer had to say. So while the first unit was a bummer, the experience was pretty educational. I am going to be in southwest Oregon the first week of May. Does the Kruger factory take walk-in traffic? Thanks for the info on those online "deals." BTW they are just moving into a new building, so they are working and moving in, unpacking, setting up etc. Sisters is Central Oregon, although you may well have to come right down Hwy 97 coming from Montana. Where in SW Oregon are you going? I am heading to Coos Bay. I didn't know they were in Sisters. I am familiar with that area, and would love to show it to my family on the trip. I am going to look into it. I have now had these for a while, so like I did with the Razor HD, I decided it was maybe a good time for an update on these as well. I mentioned that I had sold the Razor HD and went elsewhere with the money I got, specifically to the new Zen Prime HD. I need to be more specific in that these Kruger Caldera are the specific reason I decided to sell the Razor. They are also the reason I passed on the ZEN ED 3 and am waiting for the Prime. Truth be told these are very damn good binoculars, and the much more expensive Razor HD could not separate itself from either the Caldera or the ED 3. I suppose to be honest about it, since I already had these, I decided not to spend any more on the ED 3. The only cons I can check off on the Calderas score card are the fact that the ocular assemblies are pretty large in diameter. If they were any larger, I'd send them off too. But as it stands, they really work just fine for me, and I suspect that if you have average facial geometry and lack deep set eye sockets, or unless you are fairly small and have smaller than average eye diameter, they will not be an issue either. This is a necessary consequence of the eye piece design. The ocular lenses are huge. This points me to the most obvious pro of the Caldera design. Field of view is largely a function of the eyepiece design, and the rather unique eye piece of the Caldera yields a very large 438' @ 1,000 yards. That is pretty much an industry best as far as I can find. What intrigues me the most is in spite of the Caldera 438' fov, that is precious little larger than the ZEN ED 3 @ 426', the apparent fov seems a lot larger than the ZEN ED 3. The second small con is the diopter design. Mine are from the first run of Caldera and the diopter is between the focus knob and the hinge. There is a small protruding rod that is pushed down and the diopter then rotates either way to adjust for your eye. This can lead to some inadvertent movement. However, in normal use, I've never had it happen. Sometimes if it's been sitting on the seat of the truck and I've tossed a jacket or something on top. it will move when I fish out the binocular. So, while the image may be a very small amount sharper on the Razor HD, it can't be noticed without a side by side. It clearly has a flatter field than the Razor HD, and much better edge performance. Plus it is more compact in the bargain. This one's a keeper. Right on! Thanks for the update. I just ordered the 10x Caldera and should have it delivered today. Can't wait to try them out. I'm excited about the wide FoV as well as the compact design. Thanks for sharing your experiences. I will buy in november or december Kruger Caldera 10x42 and I will tested with binoculars Swarovski, Minox, Fujinon, Nikon, Pentax, Olympus. Test Report I will publish on the site. I received my Kruger Caldera 10x42 yesterday. The only bino I have on hand to compare them to are my Zen Ray ZRS 2010 10x42. I do like the body design of the Caldera, however I couldn't get them to fit my face. I do not wear glasses; normally, I have eye cups extended all the way out. With the Caldera, I was not able to achieve a full view with the eye cups all the way out, so I turned them in one notch. With them down a bit, I could see the full picture. However, at that point, the eye cups were pressing too hard on the bridge of my nose. This must be from the larger, wider eyepieces. My ZRS and other binos I use fit my eyes/face just fine. Keep in mind, this may be something individual to me and you may not experience the same problems. Optically, I went back and forth between the ZRS and Caldera, and to be honest...couldn't tell much difference. If anything, I thought the ZRS were a hair brighter and maybe better in color...which surprised me since they do not contain ED glass. The one thing I noticed the Caldera did handle better was CA. I did detect it in both pairs on high contrast objects, however it was a bit lower than the Caldera. I do like the Caldera for the body design and it did provide a nice view. However, I could not get a comfortable fit with the eye cups and my face, no matter how many adjustments I made. The view for me was not better than my ZRS. So, I will be returning them. I would definitely suggest that you try them out if interested as they appear to be a nice bino for the money; they just did not fit my face well. Also makes me realize just how impressed I am with my Zen Ray ZRS. I guessed that the eyepiece eyecups specific consruction. I refuse to buy binoculars Kruger Caldera 10x42. I'll wait for feedback Zen Prime HD. The Calderas are nice binos for sure and if someone were considering a pair, I would definitely encourage them to try them. The eyepieces just happen to be too wide for my particular face shape and were uncomfortable for me. I'm excited for the Prime HD from Zen as well. How many variation of Kruger Caldera is there? I just purchased one and it did not look like the pictures that I keep seeing of them around the internet. Mine is different from the ones I've seen around the net in that diopter area is all black. It looks like the one that has a golden dot on the diopter button except it does not have anything there but a rectangular button. The diopter markings are also black. Is there a optic quality difference between the different variations? I assume you are somewhat familiar with the Sightron Bluesky Optics from the Birdforum. As far as 10x goes the 42mm in that model is listed as FOV 367' which is larger than most and at a cost of $180 might be the best buy of a lifetime. If they perform anything like the 8-10x 32s' that is. These are the best bins I've ever used in that price range and compare very well with my Vortex and Zens. I'm currently toying with buying the 10x42 but have yet to find a good review on them anywhere. Not sure what you mean by variations. There is only one basic Kruger Caldera. They have modified the diopter adjustment. In the first release the diopter adjustment was by depressing a little metal post that sticks up from the diopter ring. The post frees the movement and the diopter can be adjusted, That is the one I have and it can be a pain because It can be depressed and the setting moved inadvertently. What Kruger did is to add a flexible ring around the diopter with a raised black spot on top of the post. This requires a more definite and purposeful action to change the diopter setting. There was some quality control issues Kruger felt they needed to change from the first version, so they adressed those in the second version along with the diopter. If you read my review, you can see I had an issue with my first Cakdera which was the second run. The cherry one I have now is from the first run. I don't have any idea of how many production runs Kruger has done on the Caldera, or what small changes they may have made on each new run. I had Frank's Blue Sky for a month or so. So I guess the question is about them and not the Caldera. That threw me for a second because the 10x Caldera is 367' too. Let me know if you are talking about the 10x32 Sightron or the 10x42 Caldera. I was talking Sightron. The 10x42 is 367' fov and $180. Seems like a sweet deal if anything like the 8x32 but that's an unknown. I was responding just to let you know there was another contender for that specific FOV. Has any one gotten one that looks like these or are these just computer renders? I just finish looking through these some more. I really like except diopter. It's a little hard to use makes the binocular look cheap. Oh yeah, there is a sort rolling ball effect on mine when I'm panning. I don't really mind it that much since the view seems pretty good through these and I don't pan that much. I could see why people have issue with this effect though. Anymore that this and I would throw up and I am of those people who never get motion sickness. Klamath since you have experience with both the Kruger Caldera and Zen Ray ED3, which one is better optically? Is there a difference? FWIW, my Caldera looks like the one in your posted picture. What does yours look like anyway? I'm starting to wonder what you really do have. The differences in the ED 3 and the Caldera are principally ergonomic. The Calders is smaller than the ED 3. The Caldera has a different feel in your hands. That Caldera does have enough wider fov that the difference can be seen. That surprised me some because I didn't think a posted 426 for the ZEN ED 3 and 438 for the Caldera. However, my Caldera actually measures 460'. Sorry to say I did not check the ED 3, but the Ed and ED 2's I have checked were right on the specified standard. The ocular assembly on the Caldera is maybe 1mm or so wider than the ED 3 and some others. Thge edges of the eye cups are pretty suqared off too. This may make the some uncomfortable feeling holding the Caldera to their eyes. Trying to call any significant optival differences is sort of like counting angels on the head of a pin. When the ED 3 came out I had the Caldera and I knew the Zen Prime HD was in the works. As a result I didn't keep the review sample and send ZR a check. I do have an ED 3 7x43. But I am waiting for the Prime. Below is how mine looks like. Yours look exactly like the picture above. OK yours are the second, and for all I know current variation with the diopter control covered by the black tab and associated ring. Yes, mine are just like the ones in they first picture you posted. Except I cut off the factory winged eye shields and replaced them with the Winged Eye Shield from Field Optics Research.